One of my coaching clients, Robert Bolton, alerted me to a two-part program produced by the ABC and now streaming on Iview: The Larrikin And The Leader. The program is about Bob Hawke, Australia’s most successful Labor Prime Minister who won four elections. I regard Bob Hawke as the archetype successful leader. Not only was he smart (he was a Rhodes Scholar) but he had in spades the three EQ components needed to be a successful leader: Socialiser (aka Mover), GoGetter (aka Hustler), Politician. If you want to understand why I consider these three components so critical you can read an extract about Leadership taken and posted from The Humm Handbook by my UK colleague Walter Blackburn. I consider the first part the better episode and it reveals all three EQ components in depth. Hawke’s energy was phenomenal: he would be negotiating as a union leader until 3am but would be up bright and early the next morning. He loves gambling: every Friday afternoon would devoted to betting on the horses. He was terrific in mixing across all levels of society. Finally he was totally focused on becoming Prime Minister, manoeuvring into that position after only being an MP for two years. Hawke’s second wife, Blanche d’Alpuget, has written two biographies about Hawke. She gave a fascinating talk to Sydney Institute in 2010: A Portrait of Leadership. I blogged about it here. It was a great talk and Blanche beautifully tagged the three characteristics of the successful leader: energy, competitive, and self-interest. Her description of her first meeting with Hawke (contained in the blog) defies belief. The second part of the series described the eight years of Hawke as Prime Minister. 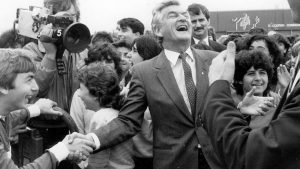 Hawke reintroduced universal health care in 1984 as Medicare was described first. That was followed by the opening to China and then tearful promise to allow Chinese students to stay in Australia after the Tiananmen Square massacre. What I found amazing in the second part that none of Hawkes’s economic achievements were described. Economic reform included the floating of the Australian dollar, deregulation of the financial system, dismantling of the tariff system, privatised state sector industries, ending subsidisation of loss-making industries, and the sale of the state-owned Commonwealth Bank of Australia, Optus, Qantas and CSL Limited. Prime Minister Howard, a Liberal, has described the floating of the dollar as easily the bravest and most courageous of any Australian Government. Many people have claimed ownership of the decision but as Howard points out it was the combined efforts of Hawke and Reserve Bank of Australia Governor, Bob Johnston, who pushed it through the resistance from the Treasury. John Stone, head of the Treasury, was a firm believer in free markets for everyone else. What I do know is that the RBA targeted Hawke as a director of the RBA. After his appointment to the RBA Board he would arrive in Sydney Airport 1 day earlier, be driven to Martin Place in Sir Peter Abeles’ Rolls Royce and attend a day of briefings by the cream of the RBA economists. The other factor missing in the second part was Hawke’s determination to not emulate the chaotic administration of the previous Whitlam Labor government. Hawke convinced the Labor caucus to divide the ministry into two tiers, with only the most important Ministers attending regular cabinet meetings. This was to avoid what Hawke viewed as the unwieldy nature of the 27-member Whitlam cabinet. In terms of decision making the Whitlam and Hawke Governments were chalk and cheese and credit must go to Hawke for his leadership style. This blog was first posted on LinkedIn on 25 January 2019.